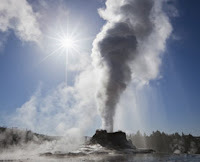 Beneath Yellowstone National Park lurks a partially molten plume rising from the Earth's mantle, fueling the park's famous geysers and hot springs, and causing the crust above to bulge and recede in response to its forces. Now, researchers report that the source beneath the surface may be even more massive than previously thought. Using a new technique, they have created an image of the plume beneath Yellowstone showing the cyclone shape stretching at a 40-degree angle to the west at a depth of 200 miles for 400 miles east to west, as far as the new technique can reach. Witness extraordinary geologic features on a journey to Yellowstone with Discovery Student Adventures.